This is an absolutely stunning map from 1858. It is also fun to look at with all of the different spellings like Corea (for Korea) or Hayti (Haiti). Notice too that Alaska is labeled “Russian America” with Alaska in much smaller letters below Cook’s Inlet. Canada is British New Britain and the Gold region of California is clearly identified for anyone wanting to go west to find their fortune. 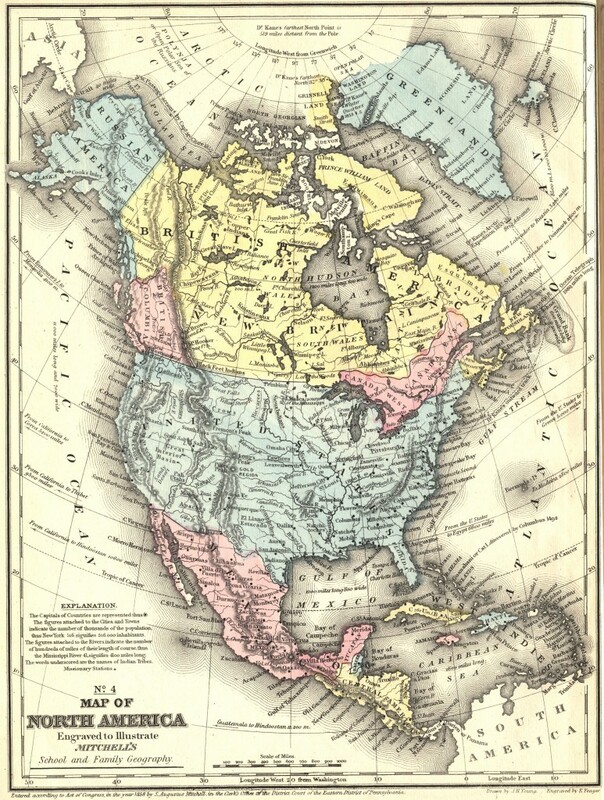 This 1858 map of North America was engraved to illustrate Mitchell’s School and Family Geography. Samuel Mitchell began publishing his School Atlas in 1839. One auction house suggested that virtually every American home with a child more than likely owned on of Mitchell’s works. The maps were revised each year to include new discoveries or other changes. The original, 1839 edition showed Mexico still owning most of California. The 1858 map shows the Mexican border being much further south and identifies the gold fields of California. Mitchell was clearly an educator as each of the maps often contained extra information. There are quite a few entries on this map that provide information like how far it would be from Vancouver Island to Mongolia (4,100 miles), the coast of the United States to Greece (5,000 miles) and California to Thibet (9,500 miles). Also identified on the 1858 map of North America is the Transatlantic telegraph cable line. It was first used in August 16, 1858. It took 4 years to build and only functioned for 3 weeks. It would be almost a decade before a stronger, more reliable cable was laid. Even today, Mitchell’s maps are wonderful for students and were I homeschooling, I would definitely include them in my lesson plans. Thankfully, a university has shared large, beautiful scans of these maps. Here I’m showing a smaller version but if you want the full-sized 1858 Map of North America by Mitchell, just click on the one you see here.